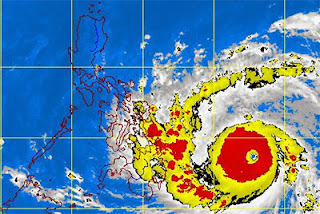 Super Typhoon Yolanda is now at East of Hinatuan, Surigao del Sur and expected to affect the Northern part of Luzon. PAGASA said earlier that Yolanda has intensified further as it continues moving Eastern Visayas. PAGASA weather bulletin as of 5 a.m. today, " the eye of Typhoon "YOLANDA"was located based on all available data at 822 km East of Hinatuan, Surigao del Sur, with maximum sustained winds of 215 kph near the center and gustiness of up to 250 kph." Yolanda was categorize as SUPER TYPHOON by the United States' Joint Typhoon Warning Center (JTWC), because it may have near-center winds of 145 knots (268.54 kph) and gusts of up to 175 knots (324.1 kph). PAGASA said, "Sea travel is risky over the eastern seaboard of Southern Luzon and Eastern Visayas." For the meantime, please bookmark this page now or visit this site more often for you to be updated. You may also share this post to your friends so they may know about Super Typhoon YOLANDA. Comments or suggestions about "Super Typhoon YOLANDA Update - November 2013" is important to us, you may share it by using the comment box below.